The arrival of a new year also implies the setting of new challenges in all areas of our lives. 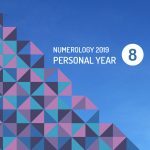 Thanks to this discipline, it is also possible to determine with Numerology 2019, personal year 8, according to various aspects or principles, how our year will pass according to the numerical combination also known as Numerological Natal Map. Number 8 is considered strong and powerful. They have great ambitions in life and they have the capacity to obtain everything they want. Another quality that characterizes them is their high organization and control of the situation. They can totally control their emotions and have dominion over others. They are very sociable and sensitive to the causes in favor of the neediest. They can “infect” their fellows with good energy and optimism. In love, they are kind of possessive and a bit jealous, but, in the same way that they surrender, they are able to, with an impressive distance, mark territory and end the relationship. All or nothing. Either you risk everything or you will lose everything so you must believe in your full potential for success. Economic stability is guaranteed during this period as long as you work hard to achieve it. Be careful not to celebrated ahead of time because to achieve success you will have to work day by day. When making the decisions you have to make, your pulse should not tremble. It will be necessary to take actions that, although they may seem hard at the beginning, will lay the foundations for a better future. For this year, you must also take special care with your health. Avoid excesses and fall into extreme situations that deteriorate your physical condition. Think of yourself and your balance first and then everything will flow better. In love, everything may not go as planned; if you have faith it is likely that everything will end up cooperating for your good. What 2018 was like for number 8? The year 2018 was a challenging period for number 8. It was necessary to work hard and tirelessly to achieve stability. The past caused some problems so it was also seen in the need to face the ghosts that prevented starting a new life. Part of the recipe for surviving problems was to keep up at all times with positive thoughts. Optimism prevented you from feeling depressed or unable to accomplish your goals. After realizing that this may be your mantra, do not forget to keep it in mind.